We really do get out in public with the boys. Here's proof! Step 1: Assess the boys' eating schedule. Never leave the house with hungry babies! It is best to leave soon after mealtime, but if this is not possible offer a bottle right before leaving so that their stomachs will be full. Hungry babies are unhappy babies and unhappy babies can scream for an amazing number of miles. You're also statistically more likely to get stuck in traffic when you have a screaming baby (or two) in your car. Step 2: Assess the boys' nap schedule. If you are going to be in the car for a while it can be OK to leave at nap time because they will hopefully sleep in the car. If you are going somewhere nearby, it's best to leave after nap time when they are awake and happy. Never leave when either or both babies are overtired! Overtired babies are comparable to hungry babies (see Step 1). Step 3: Put the boys in the crib or play yard (Jason named it the Thunderdome.) with toys so that the are entertained and safe while you make sure the diaper bag has everything you need for the outing: diapers, wipes, changing pad, scented disposable bags for dirty diapers (the kind people take on walks with their dogs), bottles, extra formula, cereal puffs, bibs, burp cloths, extra clothes (you never know what kind of messes they will make), wet bag (to store the messy clothes/bibs/burp cloths until you get home and can wash them), and toys. 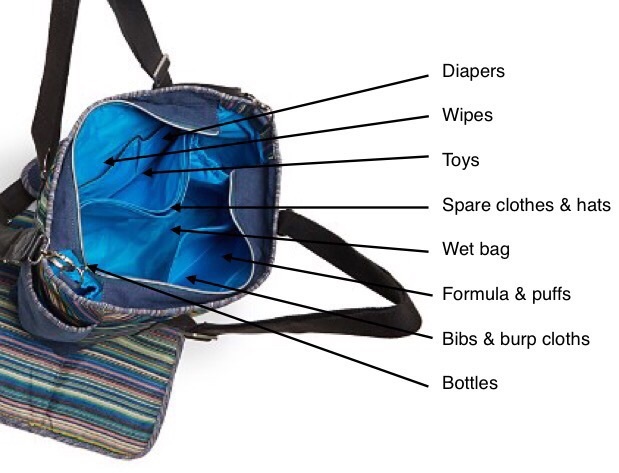 It's possible you made a diaper bag diagram because Jason said he never remembers everything when he packs. If you are going for a very quick trip you won't need the whole bag, but you should at least take diapers and wipes. Never take the babies anywhere without diapers and wipes! You just never know and you don't want to be unprepared if you have a diaper situation. Step 4: Spend more time than necessary picking out the perfect outfits for each boy, taking the weather and destination into consideration. You get to play dress up with two doll-sized humans. Enjoy it! Step 5: Change diapers and dress boys. Step 6: Realize that though your children are dressed adorably, you are still wearing your pajamas and haven't brushed your hair or teeth yet. Return babies to safe play spot and hope they play happily while you get yourself ready. Step 7: Take the diaper bag downstairs to the car. The car should be in the garage to make loading the boys as easy as possible. Step 8: Put the stroller in the trunk if you are going to need it. Unless you are going on a trip that does not require you to get out of the car or you are going somewhere where someone will meet you at the car to help carry a baby, you will need the stroller. Step 9: Go back upstairs while hoping that the boys have not started to cry due to your absence. Step 10: Load the boys into the car seats and make sure they are buckled in safely. If it is winter, they will need appropriate cold weather gear. 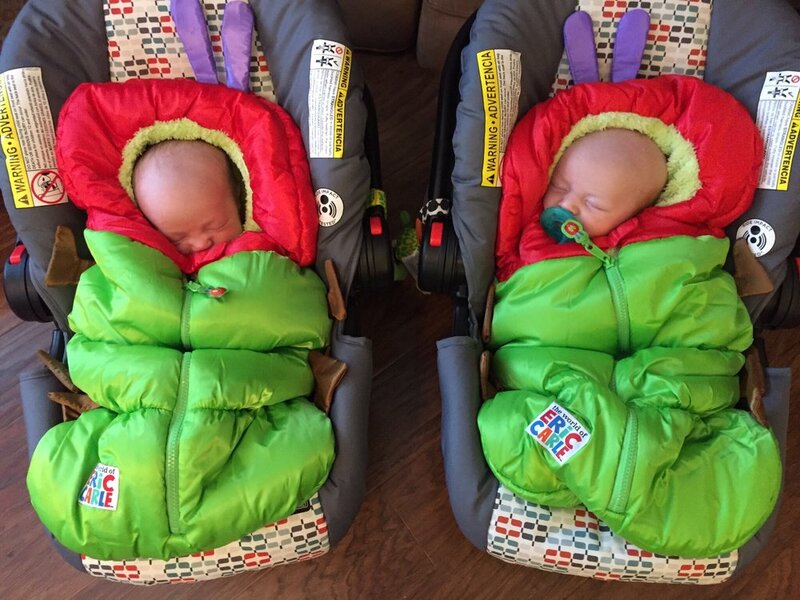 If they are newborns, their cold weather gear should be as rediculous as possible. A friend saw them from afar dressed like this and thought they were small dogs! Step 11: Carry one baby in his car seat to the top of the stairs. Step 12: Carry the other baby in his car seat to the top of the stairs. Step 13: Carry one baby downs the stairs to the garage and put him in the car, making sure his car seat clicks into place. Hope the baby upstairs isn't crying. Step 14: Go upstairs to get the other baby. Hope the baby in the car isn't crying. Step 15: Carry the second baby down the stairs to the garage and put him in the car, making sure his car seat clicks into place. Step 16: Get into the car and take a deep breath. Step 17: Feel like taking a nap after Steps 1-16 but head off to enjoy your outing instead. Joshua has keys and is ready to drive!